Please note that one serving is 4 grams of organic food powder, which equates to what will fit into the enclosed scoop. There are approximately 112 servings per bottle. Over the past few years, I've received numerous requests from clients all over the world asking for one blend of the most important vitamins, minerals, and phytonutrients that we need to take daily for optimal nourishment and protection against degenerative disease. Many want a comprehensive formula that brings together the best of our greens, acerola cherry vitamin C powder, whole food formula for bone and dental support, and our vitamin D-3 and Homocysteine Care blends. I began development of this formula in early 2013, and I'm grateful to finally bring it to our catalogue to simplify choices for many of our clients who want to take less supplements but still have peace of mind that they are optimally supporting all major organ systems. 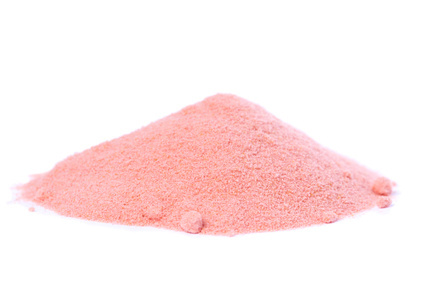 Over 600 mg of organic pomegranate fruit powder, nature's only source of punicalagin, a powerful antioxidant that can actually accelerate the rate at which your body reverses atherosclerosis. Punicalagin can also lower damaged cholesterol (oxidized LDL), which is vital for people who aren't careful in avoiding animal foods cooked at high temperatures. Punicalagin is also known for its ability to normalize blood pressure in those with hypertension. The main challenge was coming up with the right combination of organic foods to meet all of my goals for this formula. As a part of the development process, I made a trip to California to learn more about which organically grown vegetables and fruits offer the broadest and richest nutrient profiles. The goal was to include a select number of nourishing and cleansing organic foods that are easily assimilated into our bloodstream and cells, and that have virtually zero potential to trigger digestive issues. Each serving of this blend provides a minimum of 500 mg of each of these six ingredients. This was the intention - to provide substantial amounts of powerhouse foods, not just trace amounts of a mish-mash of a few dozen plants and herbs. Approximately 30 pounds of fresh foods go into each pound of organic food powder, so small amounts of these organic food powders do a lot to enhance health, and I've included at least half a gram of each of the six foods listed above in each serving. To the best of my knowledge, there's no other formula out there that comes within a country mile of offering this level of nutritional value. 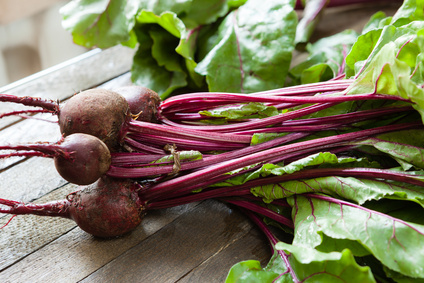 From day one of research and development for this formula, I was intent on including organic red beets for their many health benefits. To optimally support bone and dental health, as well as immune system strength, I've included 2,000 IU of vitamin D-3 per serving, as I consistently find that most people are highly deficient in vitamin D without regular supplementation, and even those who get exposure to sunlight during warmer months can often use a minimum of 2,000 to 3,000 IU of D-3 daily. Vitamin D deficiency is arguably the most common nutrition-related cause of chronic fatigue syndrome and general aches and pains; I regularly find that people who have suffered for years with chronic fatigue and fibromyalgia experience significant improvement just by bringing their 25 hydroxy D level up to the 50 to 60 ng/dL range. In my experience, 2,000 IU of D-3 is a good minimum amount in conjunction with the calcium, magnesium, phosphorus, silica, and vitamin C provided in this formula to optimally support strong bones and teeth. The large amount of natural vitamin C per serving is also intended to support gum health and efficient healing of everyday niggles - the full vitamin C complex isn't a substitute for over-the-counter anti-inflammatories like ibuprofen, but I find that people who are consistent with their natural vitamin C intake tend to suffer less everyday aches, and heal efficiently from injuries like back sprains and strains. If you're not taking some form of natural vitamin C daily or eating a good amount of foods that are naturally rich in C, I highly recommend giving it a try. 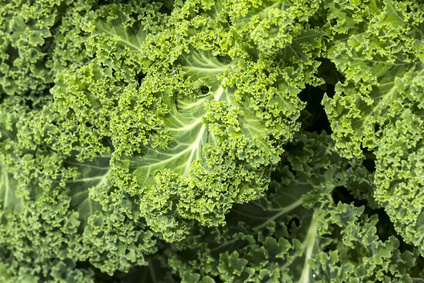 To prevent build-up of homocysteine in the body and associated arterial disease, I've also included optimal amounts of vitamins B-12 and B-6 to work in conjunction with folate that is naturally abundant in the three organic greens that serve as the foundation of this formula: organic oat grass, organic barley grass, and organic kale leaf. Keeping our homocysteine level relatively low is essential to preventing cardiovascular disease and neurodegenerative diseases like Alzheimer's and Parkinson's. 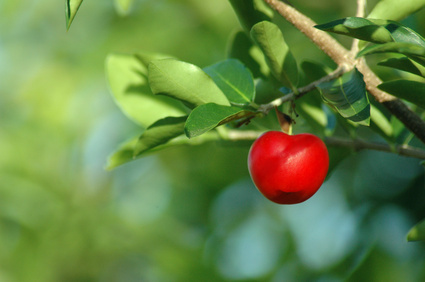 The rich antioxidant-containing pigments in the organic greens, acerola fruit, beet root, and pomegranate fruit offer significant protection against free radical damage, which translates to lowered risk of all types of cancer. This whole food multi is especially rich in betalain and carotenoid pigments that, when ingested regularly, offer some level of inside-out natural protection against sunburn by UV rays. 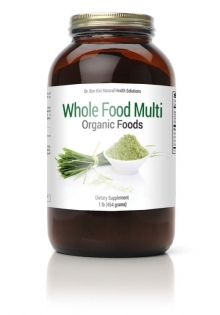 If you're not taking any other supplements, I feel that 1 scoop (included) of this organic whole food multi daily is a good amount to offer optimal nourishing and protective effects. This special blend of organic foods is free of dairy, gluten, soy, eggs, corn, nuts, shellfish, pesticides, herbicides, sweeteners, dissolvents, and preservatives. Suggested Serving Size: One scoop (included), equal to 4 grams, approximately 1.5 average teaspoons. If you're not completely satisfied with the quality of our organic whole food multi, simply let me know and I'll authorize an immediate refund, minus shipping and handling, no questions asked. It's typically difficult to offer such a satisfaction guarantee with food supplements since individual circumstances vary widely; this is the extent to which I believe that we've crafted an organic whole food vitamin and mineral supplement that is highly nourishing and protective for grown-ups and kids alike. Please note that for children under 12 years of age, the suggested amount is half a scoop daily - each pouch comes with an accompanying scoop for easy measuring. 3. Kim ND, Mehta R, Yu W, et al. Chemopreventive and adjuvant therapeutic potential of pomegranate (Punica granatum) for human breast cancer. Breast Cancer Res Treat 2002;71(3):203-17. 4. Kohno H, Suzuki R, Yasui Y, et al. Pomegranate seed oil rich in conjugated linolenic acid suppresses chemically induced colon carcinogenesis in rats. Cancer Sci 2004;95(6):481-6. 7. Lappe JM, Travers-Gustafson D, Davies KM, Recker RR, Heaney RP. Vitamin D and calcium supplementation reduces cancer risk: results of a randomized trial. Am J Clin Nutr 2007; 85(6):1586-1591. 8. Hypponen E, Laara E, Jarvelin M-R, Virtanen SM. Intake of vitamin D and risk of type 1 diabetes: a birth-cohort study. Lancet 2001;358:1500-1503. 9. Pittas AG, Dawson-Hughes B, Li T, et al. Vitamin D and calcium intake in relation to type 2 diabetes in women. Diabetes Care 2006:29:650-56. 10. Boonen S, Bischoff-Ferrari A, Cooper C, Lips P, Ljunggren O, Meunier PJ, Reginster JY. Addressing the musculoskeletal components of fracture risk with calcium and vitamin D: a review of the evidence. Calcif Tissue Int 2006; 78(5):257-70. 11. Chapuy MC, Arlot ME, Duboeuf F, Brun J, Crouzet B, Arnaud S, Delmas PD, Meunier PJ. Vitamin D3 and calcium to prevent hip fractures in elderly women. N Engl J Med 1992; 327(23):1637-1642. 12. Holick, M.F. Vitamin D deficiency: What a Pain it is. Mayo Clin. Proc. 2003; 78(12): 1457-1459. 13. Munger KL, Zhang SM, O�Reilly E, Hernan MA, Olek MJ, Willett WC, Ascherio A. Vitamin D intake and incidence of multiple sclerosis. Neurology 2004; 62(1):60-5. 14. Munger KL, Levin LI, Hollis, BW, Howard NS, Ascheino A. Serum 25-hydroxyvitamin D levels and risk of multiple sclerosis. JAMA 2006; 296:2832-2838. 15. Ponsonby A-L, McMichael A, and van der Mei I. Ultraviolet radiation and autoimmune disease: insights from epidemiological research. Toxocology 2002;181-182:71-78. 16. Merlino LA, Curtis J, Mikuls TR, Cerhan JR, Criswell LA, and Saag KG. Vitamin D intake is inversely associated with rheumatoid arthritis. Arthritis & Rheumatism 2004; 50(1):72-77. 17. Gallo, R.L., Eisenberg, D., Hewison, M., Hollis, B.W., Adams, J.S., Bloom, B.R., Modlin, R.L. 2006. Toll-like receptor Triggering of a vitamin D-mediated human antimicrobial response. ScienceXpress. 3:1770-1773. THE BEST Multi on the market, with the highest quality ingredients! Thanks Dr. Kim! This takes the ache out of my hips, legs, and feet during my period. I suppose that could be the placebo effect, but if so, it is one powerful placebo effect. I blended this with water, a peach, and ice yesterday, and it made a delicious smoothie. I have used this product regularly for about a year. My blood pressure has stabilized. My doctor has not released me yet from taking one BP pill a day which is the only prescription I am required to take. Since taking Organic Whole Food Multi, my total cholesterol decreased 50 points, HDL increased 18 points, LDL decreased 22 points, triglycerides decreased 49 points. I am almost 75 years old and plan to continue taking 'the Multi' from now on twice each day. Thank you Dr. Kim! God bless you for the integrity of your products. I am about to order my 2nd bottle! I experimented solely using this multi powder with no other supplement. I feel so good and have never been able to grow nails until now! I also cured a headache I had one day and low blood sugar on another day by mixing an extra 1/2 scoop of this great multi! I finally found my golden vitamin! As an avid student of nutrition and health for over forty years, and having supplemented my generally healthy life over that time with some quite good nutrient supplements, I can attest that this product is the absolute best. Not only is the quality of the supplement blend extremely beneficial, but its form and purity make it highly assimilable, even to those of us with challenged digestion. Thank you, Dr. Kim! The whole food multi, and all the other products which I regularly buy, are wonderful. I will continue buying. Thank you so much Dr. Kim! I have been taking one to two scoops per day and noticed I don't bruise as easily, also gives me more energy to get through my day. I have been taking Dr. Ben's Organic Greens or the new Whole food Multi powder for better than 2 years now. No colds, no upper respiratory infections, higher energy, stronger nails AND a benefit I hadn't even counted on - the measurement of the "pockets" of my gums totally reversed itself. My dental hygienist couldn't believe it and ask what I had been doing differently!! I love that this new blend contains the greens, acerola cherry powder, vitamin D-3 AND Homocysteine Care all in one powder. I was buying all 4 separately and can now get all the benefits in one fell swoop!!! I also love the addition of pomegranate as I had been mixing my greens in pomegranate juice for its health benefits, especially for joint pain and its cancer fighting properties. The only thing missing for me in the new Whole Food Multi in comparison with the Original organic Greens formula is the probiotic. Thank you, Dr. Kim, for providing such superior products! When taking this product, I basically don't get sick. Usually I get at least one or two colds over the winter months each year, but once I started this formula I went through the whole winter without getting sick once. If I felt a little something coming on after being around a lot of people, I'd take an extra dose after arriving home and by morning I'd feel normal. Excellent product. I started taking this because after my last physical, my doctor told me that I have some buildup in my arteries and am showing other signs of early heart disease. This scared me and also made me realize that the shortness of breath that I felt sometimes was something I shouldn't ignore. After taking this every day for the past year, my breathing feels so clear and free. Before, I felt I couldn't inhale all the way, which is odd because I am athletic and still play competitive squash at a good level. The kicker is that I went to see my doctor again last week and he said almost right away that my blood pressure, pulse, and lung sounds told him that my heart and lungs are in better shape. I found out this morning that my blood work shows that my numbers have improved dramatically since last time. My homocysteine went from 15.5 to 8.7. I am taking this for life. Thank you Dr. Ben Kim! I purchased this Whole Food Multi powder and I am so happy with it! For years I couldn't sleep well with Restless Leg Syndrome and the very first day I used the powder I slept easily and have been sleeping well since. I have more energy and feel amazing . To buy all the ingredients this has would get expensive and probably time consuming to prepare; this powder is quick and simple to use. My husband also adds it into his juice daily and has reported less aches and pains during his day. Thank you sooo much for creating this powder I will certainly be buying more when my supply runs out :) . I live in Canada and it took about 10 business days to arrive by mail with no extra duties or taxes. Just a quick note: both my parents had open heart surgery and my whole family has been on heart medication and blood pressure meds for years. My EMT friend checks my blood pressure regularly and it has normalized since starting the Organic Whole Food Multi powder . I am beyond thrilled !! I have been taking this powder either plain (tastes like green beets) or mixed with an Orange Fiber powder in Dr.Kims shaker bottle. Wow! I take RA meds and they really effect my digestive health. But I feel the difference for the better with this! 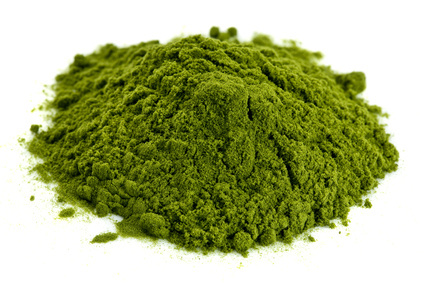 Other green powders have upset my gut so much I had to stop, this is just the opposite. Dare I say, my RA symptoms are eased as well as my digestive tract is much less tainted by my meds. I honestly feel much more like me, but with a new energy! I highly recommend this powder! I am trusting that Dr Kim is ethical and I am getting what he says I am getting.with this powder blend.because I sure feel great! Thank you! I've been using this product for 10 days, and already feel a difference! More energy, more endurance and a chronic cough I had developed has been fading fast. The amazing thing is, I was using a very comprehensive multi before using this product and it didn't provide any noticeable difference. Wonderful product, will not be without this now! This multi helped cure my benign tremor! I had developed noticeably shaky hands and had tried taking various vitamin b combinations but I suspect I'm sensitive to vitamin B12 and they caused frequent heart palpitations. This whole food multi was the only thing I found that relieved all my issues. No shaky hands and no heart palpitations and I hardly ever get sick anymore. I plan to buy this for life. If you ever stop making it, I hope you'll let us know how to recreate it. This has made such a difference in my life. Thank you Dr. Ben Kim. I have been taking Dr. Ben's Organic Greens or the new Whole food Multi powder for better than 2 years now. No colds, no upper respiratory infections, higher energy, stronger nails AND a benefit I hadn't even counted on - the measurement of the "pockets" of my gums totally reversed itself. My dental hygienist couldn't believe it and ask what I had been doing differently!! I love that this new blend contains the greens, acerola cherry powder, vitamin D-3 AND Homocysteine Care all in one powder. I was buying all 4 separately and can now get all the benefits in one fell swoop!!! 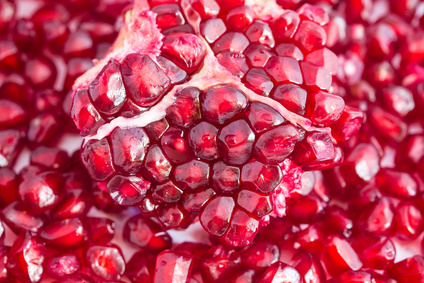 I also love the addition of pomegranate as I had been mixing my greens in pomegranate juice for its health benefits, especially for joint pain and its cancer fighting properties. The only thing missing for me in the new Whole Food Multi in comparison with the Original organic Greens formula is the probiotic. Thanks you Dr. Kim for providing such superior products! I love this whole food multi-super food powder. Both my husband and I take a scoop every day. We have both noticed our skin is softer. We also have not been ill this winter as a lot of people are suffering from respiratory issues.